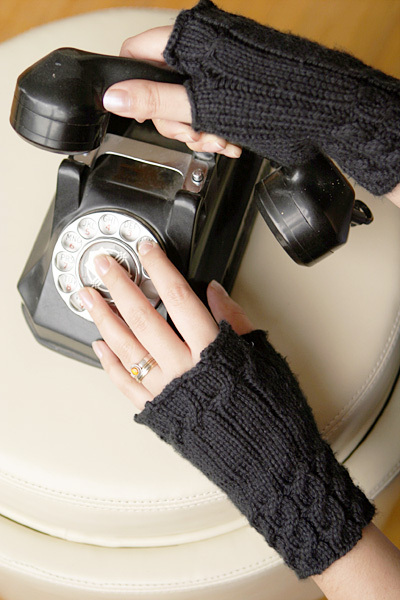 These fingerless gloves come pretty close to instant knitting gratification: buy your yarn on Friday after work, and by Sunday evening you can have a new pair of stylish handwarmers to enhance your Monday commute. 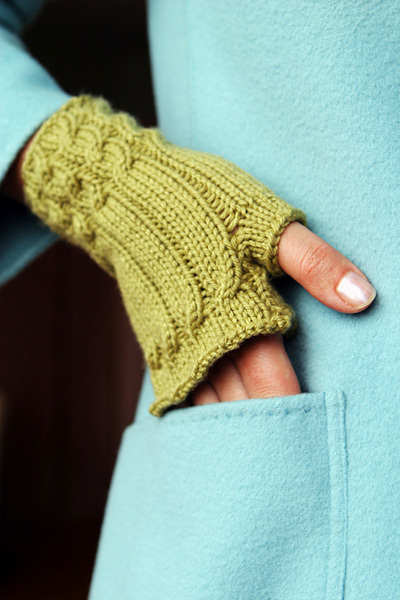 The cables hold the gloves nicely at your wrist and across your knuckles, and are excellent for keeping you warm yet unhindered while knitting, typing, or enjoying a coffee at an outdoor café. If you have never tried knitting cables before, this would be an excellent project to start with. The cable pattern is simple, and if you make a mistake and end up having to rip out some rows, it shouldn't take you long to catch up. A note about the yarn: Debbie Bliss Cashmerino Aran is beautiful and soft and comes in gorgeous colors. The cool thing about these gloves is that you only need one skein to make a pair. However, you have to be willing to unravel your gauge swatch to do this, because one pair takes an entire skein with less than a yard of yarn left over. If you feel the need to keep your gauge swatches, you will need to buy two skeins. Also, note that the gauge listed on the yarn label is 18 stitches over 4 inches, while the gauge for this pattern is 21 stitches over 4 inches. That's because smaller-than-recommended needles are used to create the thick, velvety knitted fabric. C4B: Slip next 2 sts to cable needle (or spare double-point needle) and hold to back of work; k2, k2 from cable needle. C4F: Slip next 2 sts to cable needle (or spare double-point needle) and hold to front of work; k2, k2 from cable needle. Repeat this round for 4x1 Rib. CO 45 sts. Divide between needles, placing 15 sts on each needle. Join to begin working in the round, being careful not to twist. After first round, place safety pin or split ring marker in work to indicate beginning of round. Work 4 rounds in 4x1 Rib. Cable Round: [C4B, p1] to end. Work 5 rounds in 4x1 Rib. Repeat these 6 rounds once more. Work 18 rounds in 4x1 Rib. Next Round: Using waste yarn, k7; slip these sts back to left needle and k them again using working yarn; work in 4x1 Rib as set to end. Work 4 more rounds in 4x1 Rib. BO 5 sts, [slip st on right needle back to left needle; CO 1 st using Cable Cast On method, BO 6 sts] until all sts have been bound off, slip st on right needle back to left needle; CO 1 st using Cable Cast On method, BO remaining st. Break yarn and draw through last st. Thread yarn tail on tapestry needle and sew yarn tail to beginning of BO round. Weave in end. Carefully remove waste yarn and place resulting live sts on two double-point needles; there will be 7 sts below the opening and 6 sts above. Attach yarn and k the 7 sts on lower needle; using a second needle, pick up and k 2 sts in space between upper and lower needle, k first 3 sts from upper needle; using a third needle, k remaining 3 sts from upper needle and pick up and k 2 sts in space between this needle and lower needle. 17 sts. K 4 rounds. BO loosely (so you don't cut off the circulation in your thumbs when you're wearing the gloves!). Cable Round: [C4F, p1] to end. This way, the cables on each hand will twist fetchingly toward your thumbs. 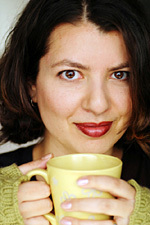 She lives in Vancouver, BC, and has a thing about sweaters.